Key Verse: Verse 8 - "Why should it be thought a thing incredible with you, that God should raise the dead?" I often ask myself how it is even possible that men should doubt the resurrection from the dead. It is far more incredible that there should be no resurrection. The question of Paul to King Agrippa was, Why should it be thought a thing incredible with you, that God should raise the dead? If there is no resurrection, this life really has no meaning, it becomes hollow and empty. Then God Who created us is a God of sheer sorrow...is this life all there is? Just a few years of alternating between crying and laughing, mostly crying, and then death? Then we must say with the Apostle Paul, If in this life only we have hope in Christ, we are of all men most miserable. But the resurrection should not be incredible to us, for all things around us remind us of the resurrection. The buds on the trees, the flowers in the garden, the emerging of life after a long winter of inactivity, all point to the resurrection. In an ancient tomb in France, buried under the debris, archaeologists found flower seeds which had been there for 2,000 years! The explorers took the seeds and planted them and to no one’s amazement, they grew. 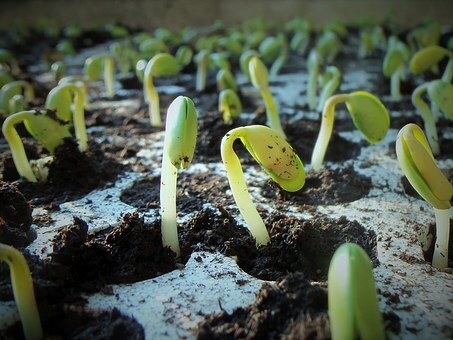 Egyptian garden peas which had been buried for 3,000 years were brought and planted, and you guessed it, within a few days they had germinated and broken ground–buried 3,000 years and then resurrected to life! Why then should it be thought a thing incredible that God should raise the dead? If God can cause a lump of clay to become alive at the creation of man, then again, I ask why can man not believe in the resurrection? To me the most incredible thing would be for Jesus to live the life He lived and then remain dead. Hallelujah! Christ arose! Amen and amen! And because He lives, I too can and will live for eternity. So can you by believing that Jesus is the Christ, your Savior. ✞ Believe in the resurrection (Romans 10:9-10).